In a move welcomed by many Antrim parents The Traditional Unionist Voice (TUV) leader Jim Allister has issued a press statement on Parkhall College, once the only state secondary school in Antrim. Most telling is that Jim Allister is not an Antrim councillor, MLA or MP but has listened and acted on behalf of parents from Antrim when their elected representatives have remained silent. 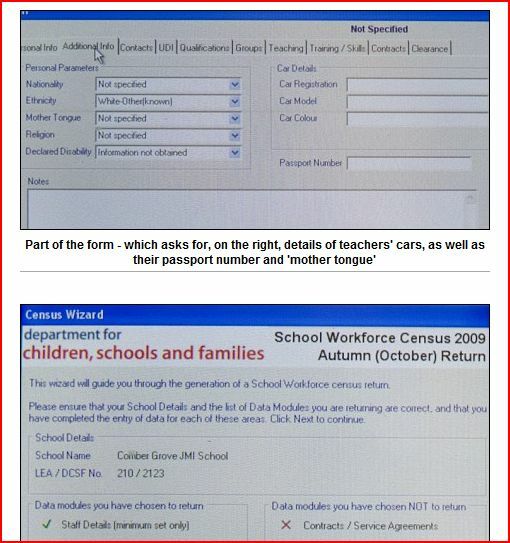 The triple-jobbing non-constituency member of parliament for the area, William McCrea, MP MLA has been typically and conspicuously silent on the transformation of the school from controlled to integrated status. The DUP education spokesperson, Mervyn Storey is familar with such experiences as a school in his constituency, Ballymoney Model School transformed while Storey was a member of the board of governors. Rank earned him no privileges. His failures may pale in comparison however to the three Ulster Unionist members of the Board of Governors of Parkhall school who may quit their involvement with the school after helping to deliver to integrated status against the wishes of the local community. Mr Boyd’s time at the helm in CCEA was characterised by radical curriculum reform: he introduced a “progressivist” curriculum which moves us away from the tried and trusted priority of grounding children in the basics of English, mathematics, reading and science and instead emphasises, often in the critical early years through mere play, self-development of “the whole child”, leading inexorably to a woolly, frothy product, incapable of objective testing. Hence the link between this approach to education and outlawing selection. In an address to the Qualifications and Curriculum Authority, Mr Boyd’s manager for Curriculum Development, Carmel Gallagher, described the curriculum as a “Trojan Horse that would be the vehicle for effecting significant change.” The chaos which is playing out before our eyes is the result. Parents can only wonder what will come next from Mr Allister. In an interview with Mark Devenport on BBC Inside Politics Martin McGuinness added his latest “prediction” on the question of post-primary transfer. “In my view there is a growing consensus about the age of 14 for transfer” said the man who asked a series of questions on post-primary transfer in 2002 to which he received answers OPPOSITE to his predictions. Of course he ignored those responses from parents. When asked, Martin McGuinness refused to comment on the Jim Allister paper because he claimed he hadn’t seen the document. No doubt arrangements could be made for Martin McGuinness to see the document admitted by his party colleague John O’Dowd that Sinn Fein have had sight of. 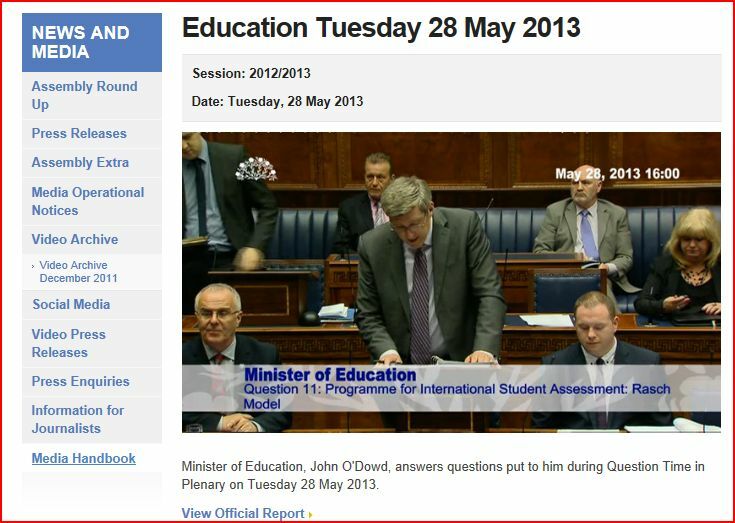 Have the DUP saved Academic Selection at 11? 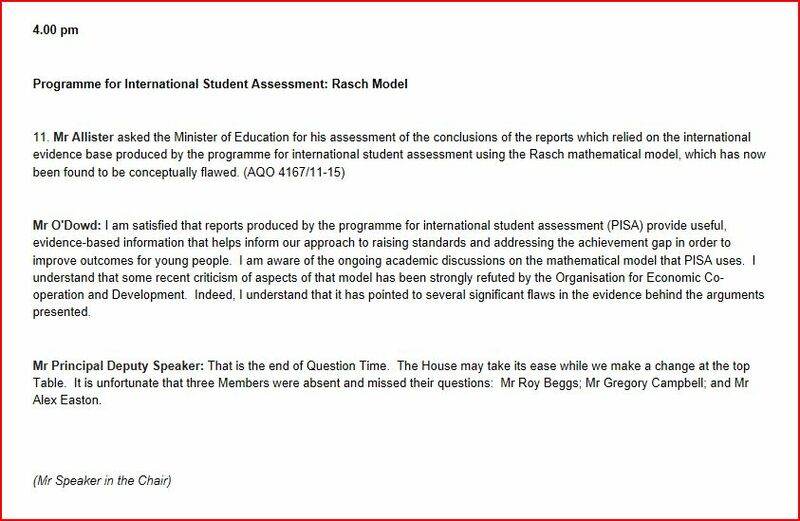 In addition to Ulster Unionist Party concerns about the ESA Bill troubles on the education front abound. The Democratic Unionist Party, the DUP seem to have reversed a position cited in the Times Educational Supplement recently on academic selection at 14. According to a press release from Traditional Unionist Voice’s Jim Allister MEP the DUP provided a position paper to Sinn Fein on the subject of transfer at 14. The BBC have picked up the story. No doubt more to follow.